Increasing the power to 140 W from 50 W of our previous models (HAKKO 474・475), it can make it easy to desolder on multi-layer PWB which was never an easy job, and it can also shorten the process time. 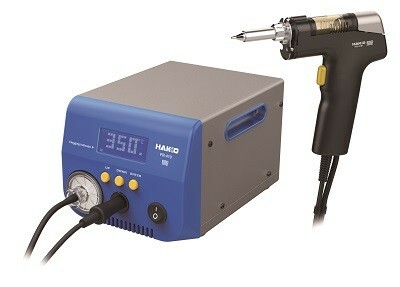 A wide selection of nozzle, with the addition of new types, is available for a variety of desoldering works. Applicable to even micro lands, components in a narrow space or flat type terminals on the PWB of downsized devices like mobile phone. Suction starts 0.2 seconds after pulling the trigger for instance and high pressure suction to achieve complete desoldering. Heating ability for backside of heating core is increased to ensure suctioned solder be carried to filter pipe and avoid solder clogging. ACF (Anti Clogging Function) ensures suctioned solder be carried to filter pipe by keeping the pump running for a certain period of time (1 to 5 seconds) automatically after releasing trigger. The dedicated wrench allows safe, easy and smooth nozzle replacement. Easy heater replacement by removing 3 screws on the part of heating core. Filter size has been increased to protect the pump from contaminants, and transparent filter cover allows quick visual check of the filter condition. FR-410 comes with a tool box that contains of maintenance tools to keep nozzles and heater in a good condition.